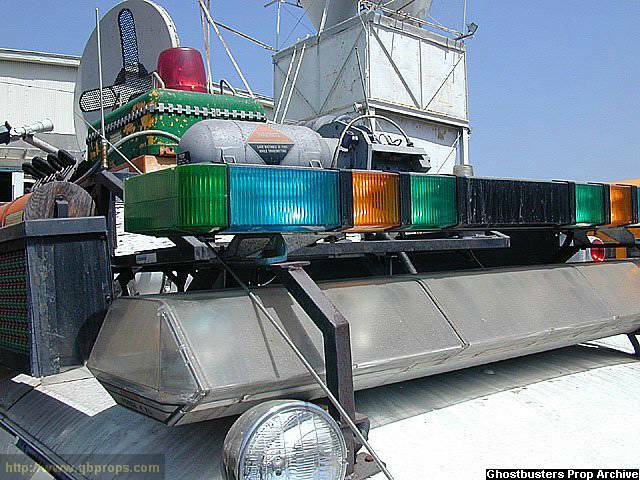 The Ecto-1 used 49" Force 4 XL Lightbars front and rear with blue domes and 11" chrome center speaker housings. Eventually the "Force 4" became "Code 3 Force 4", then just "Code 3". The domes are no longer available new from Code 3, they have been discontinued and are not going to be produced any longer. When the car from the movie was rebuilt, the front bar is now a 54" with a much wider speaker grill than the original screen-used bar. This wider bar shows up in several close up pictures in the Ecto-1 repair manual, causing a little confusion when compared to the screen-capture pictures. The Ecto-1A used 54" Force 4 XL lightbars front and rear with three clear domes on each, no speaker grill, and multi-colored rotator filters (amber, green and red in the front bar, amber green and blue in the rear). The lightbar used on the Ecto-1 was the Code 3 Force 4 XL 48" Lightbar, Model #9000 SAE-W3-79. 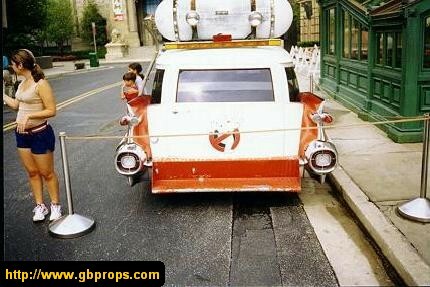 There were two of these used on the front and back of the roof on the Ecto-1. The blue lenses for the Lightbar are still available from Code 3, they are part number: S22003M. An inquiry to code-3 on 11/12/09 showed these run $256 each. They recommended to locate a distributor for a lower price as the manufacturer needs to sell them at "list price" only. A list can be found in the Code 3 website linked below. Update - 07/29/16 - According to James Baker at Code 3, there are no more replacement lenses being made. They are no longer tooled for reproducing that particular lens. 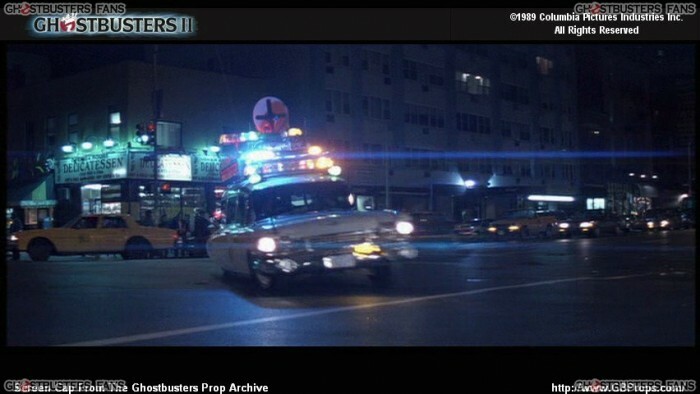 The Ecto-1A uses three different model lightbars. One of the models is the same Code 3 Force 4 XL that was used on the Ecto-1. However, different lenses and rotators were used on these bars. They have clear domes and have replaced the center chrome grill section with more rotators. In addition, there have been filters placed on the rotators that produce blue, red, green and amber colors. There are two of these bars, one on the front and one mounted high on the rear of the roof rack. These bars were custom made for the Ecto-1A, however the current owner of an Ecto-1A replica was able to have Whelen recreate a set for him. The next light bar used is a Whelen Edge 9000 bar. This bar also has blue, amber and green as the colors on the bar. The last light bar is an amber directional stick. While the manufacturer is unknown at this time, it is believed to be a Whelen product.